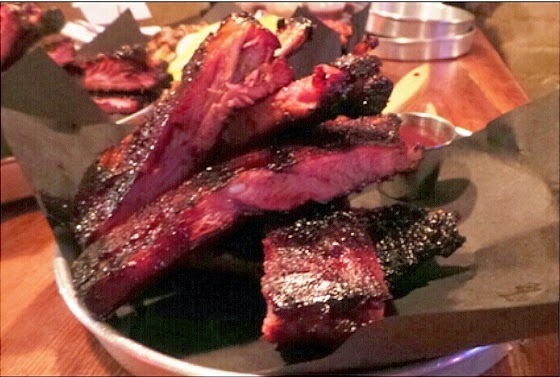 AwesomeJennJenn: Bring On The Meat Sweats With Smoque N Bones! Bring On The Meat Sweats With Smoque N Bones! I visited Smoque N' Bones awhile back, with Yelp. That night we were given some delicious treats off of the menu to try and I've been wanting to go back ever since! So when I was invited out to try out some of the new menu options...I was more than eager. I will gladly be the guinea pig taste testing new Southern BBQ food. No problem! Did you know Smoque N' Bones does brunch?! Peach stuffed french toast, anyone? Yes, please! When my sister and I arrived we were brought to our reserved seats right in front of the carving station. The hot seat! The best seats in the house! I spoke with Alexandria, Chef Alex's partner in crime. I asked her what cocktails she would suggest. Which was her favourite, and which was a crowd favourite. We ended up ordering a Maple Bacon Old Fashioned and a Not So Traditional Bourbon Sour. Everything's better with bacon, even the original cocktail. Bacon infused bourbon, maple syrup, walnut and orange bitters. Garnished with a cherry and an orange twist. Simple and dependable. An excellent initiation drink for bourbon virgins and die hard devotees alike. Fresh lemon juice, vanilla-infused syrup, Jim Bean Black with a frosted egg white head. Side note: I saved the bacon in my Maple Bacon Old Fashioned for last and it was a delicious, alcoholic slice of bacon. First up was the Cobb Salad. I didn't know they had this, but apparently it's been voted the best in Toronto! So we were excited to dig in! Loaded with avocado, corn, eggs, tomatoes, red onion, blue cheese and chicken - this salad was a meal in itself! Next up, Chef Alex surprised with a dish that is not on their menu...yet! Bacon wrapped chicken brushed with their in-house made BBQ sauce. Heaven...in my mouth. I couldn't get enough! This was so good! My sister and I may have fought over the last piece. Just when I thought I had tasted heaven...Chef Alex presented us with a platter that looked like it was sent down from the meat Gods themselves. Bring on the meat sweats! As we were busy stuffing our faces eating like the classy ladies we are, I was chatting with Chef Alex. He let me know the beef ribs were new to the menu. He is very particular about what he serves and he only wants to serve the best. So, therefore, he has made a deal with a supplier to supply him with only the best cuts. Trust me - if he has them in stock - order them. They were fall off the bone, melt in your mouth delicious. Chef Alex also let me in on a little secret! They're working on a late night menu, that'll be served until 2am in the brand spanking new bar area they are opening up upstairs! In addition to the late night menu, Chef Alex is always working on new recipes and ways to add to their existing menu. Now, you know I love you, and now you know I love Smoque N' Bones...so...I've partnered with them to offer you the chance to win a delicious Chef's Platter for yourself (and a friend, if you so choose to invite someone along)! Simply enter through the Rafflecopter widget below. Tweet me and let me know if you would pick either beef or pork ribs!